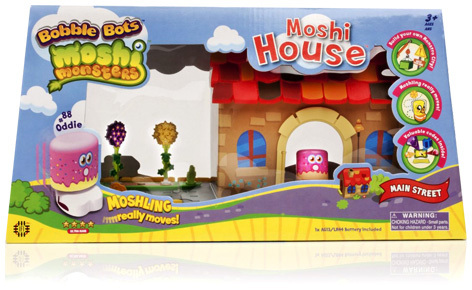 Innovation First's Bobble Bots Moshi Monster House is a perfect playset for kids to enjoy their collection of these amazing little vibrating characters, and is suitable for any of the Moshling toys. Each house comes with a terrific range of accessories, as well as an ultra-rare Oddie Moshling. Every playset comes with a set of secret codes that unlock more content in the Moshi Monsters online world. • Mushrooms, weeds, flowers and rocks. As the largest playset in the Bobble Bots collection, kids can easily add to their Moshi Monster House by collecting any of the smaller sets to make an even bigger play environment. They can choose from the Ice Scream Store, Gross-ery Store or Bizarre Bazaar Store plus choose from over twenty different Bobble Bots Moshlings to increase their collection. 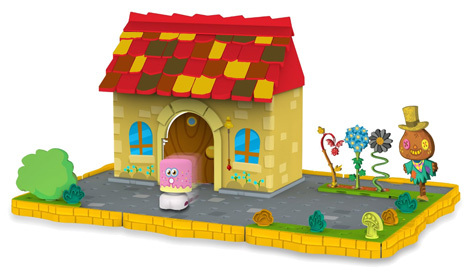 Please tell us what you think of the Bobble Bots Moshi Monster House by Moshi Monsters.